Do you have a question? About anything? From simple questions about cats to more complex queries on quantum mechanics, the answer exists out there, somewhere, on the internet. 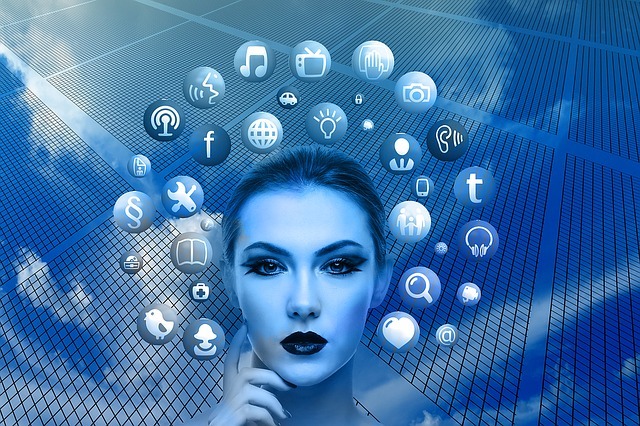 The internet has made information so easily available that complete and well thought answers to complicated questions can be communicated in gory detail just as easily as simple answers. Detailed explanations, full length articles and essays can be transmitted easily straight to anyone’s smart phone! Information has become democratized and freely available. That very same internet has inundated us with so much information and junk that we can’t begin to read those articles. We can’t find anything anymore; there’s just too much to sift through. Attached to all that information are the internet advertising and apps. These train our poor brains to win tiny little dopamine rewards by constant clicking and linking. We can’t stay in one place long enough to read a well-written article, only snippets. We are addicted to grabbing an iota of information and moving on to the next sparkly web page. We have become a culture of complex ideas, each crammed into a tiny, shiny package for instant consumption. That tiny, shiny package, that iota of cultural references is transferred via the “meme”. The meme satisfies our addiction for information and idea consumption, in an unhealthy format. Like the fast food we’re used to consuming from the drive through, the memes we consume on our internet surfing expedition provide a quick hit of satisfaction, but have practically no nutritional value for our minds. In many cases, they can damage our minds as much as fast food damages our bodies. Memes are intended to communicate culture in small bits to serve our fast-information cravings. 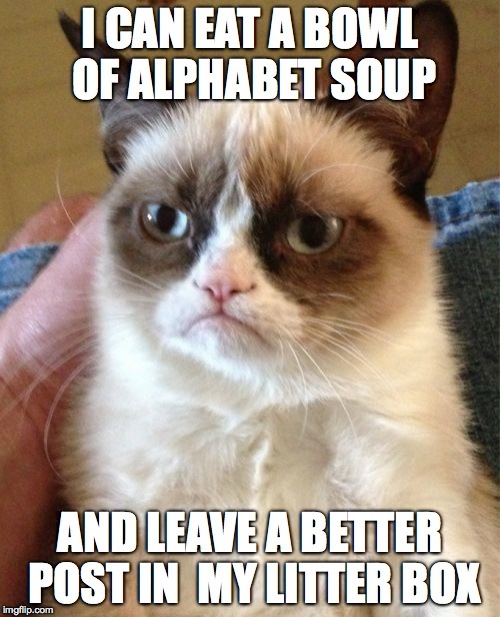 We started with a purely humorous and entertaining “grumpy cat” meme. No harm there, but there is no cultural nutrition. The memes started getting worse. Nowadays many memes don’t even communicate small bits of info. The sad story is that the fast information fixes via memes seem to be getting worse. Nowadays memes are written in street vernacular instead of actual language. When did “da” become a legitimate replacement for “the”? Not only do we have poor enunciation and poor verbal skills, but that has eroded the written language via memes. Why destroy the language? 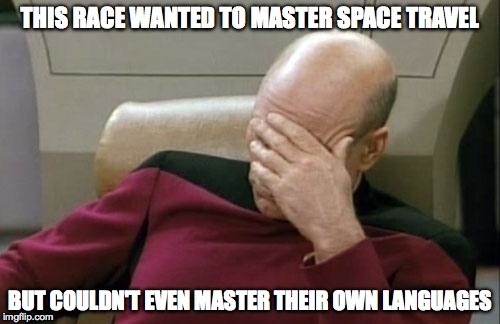 I recently came across a meme that asserted that a noun should be considered a verb instead. According to that meme, changing our basic grammatical rules will solve all our problems. I beg to disagree. Instead, maybe we should examine how we interpret the world instead of changing the rules of grammar. Poorly designed memes are eroding our language, our grammar, and our interpretations of basic concepts. Bad memes are actually destroying the way we communicate and think, not making communications quicker and easier. Language is taken for granted nowadays. We tend to forget how important it is. Our ability to communicate ideas through language enabled the rise of civilization. It enabled the sharing of ideas and cooperation among people. It enabled agriculture, coordinated hunting, and governmental units. The human race is where we are socially and technologically because of language. Language is the lubricant that enabled the development of civilization. Any engineer or scientist will tell you that the computers behind the internet have become powerful because they speak a collection of very precise digital languages. Computers work because of precise language between them. The world is pretty complex nowadays. Our language is still pretty simple. The bandwidth that we have to communicate complex ideas is limited by the simplicity of whatever language we speak. One would think that we would strive to make our language more precise in order to maximize our limited bandwidth. Instead we’re deliberately introducing ambiguity and uncertainty in to our human languages. We’re destroying our human languages through the use of memes, especially bad memes. We’re adding abrasives and contaminants to the lubricant of society. As our language becomes contaminated, the mechanisms of our society start to fail. Ironically enough, it’s the precise language of computers that is spreading our own seeds of destruction. Perhaps society will evolve to deal with more and more ambiguity in communications. Maybe the computers will have to explain it all to us. Siri and Alexa already do that; I’m sure they can be programmed to translate the ambiguity of any street or internet vernacular into personal terms. On the other hand, maybe the bad memes will die out on their own. If the bad memes communicate information poorly, they won’t reproduce or be shared. Maybe the parts of society using the contaminated language will erode and die, leaving the working parts to thrive. Maybe the people who create the bad memes will get fewer and fewer “likes” until those people fail to get a quick dopamine fix from posting them. If there are bad memes, are there good memes? Of course there are. Unlike bad memes, good memes require careful thought and design. Good memes do communicate quickly, but they also trigger deeper thought on an issue. Look at these examples for some good memes. Personally I think memes are here to stay. The harmless humor will persist. The stupid and contaminated memes will continue as long as no real damage is done. And a few well engineered memes might actually spur some real thought and action. For now, think before you meme. Love this post? Hate it? Leave a comment!